Over the course of Betty White’s recent blazing-hot comeback, she’s played a hit-taking, Snickers-eating football player; a pee-drinking anthropology professor (Community); exaggerated Larry David-esque versions of herself (30 Rock, Ugly Betty); and, in The Proposal, Sandra Bullock’s character’s randy grandma who harasses an unlikely stripper played by Oscar from The Office -- not to mention being, at age 88, the oldest person ever to host Saturday Night Live. 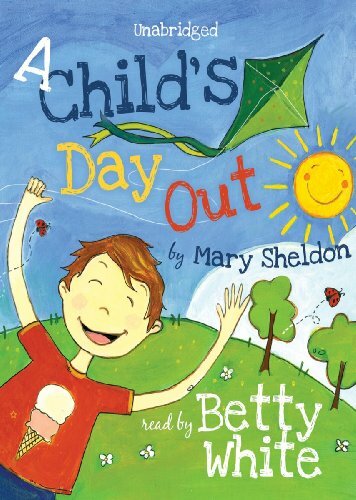 On top of all that irony-studded glamour, she narrates A Child’s Day Out (Blackstone Audiobooks), audio stories by Mary Sheldon. The five-CD set (approximately 5 ½ hours) includes seven tales following main character Lizzie and her pal Eric as they have bland elementary-school-aged adventures. Jaunty, inoffensive music plays in the background as White relates how the friends visit an aquarium, meet some farm animals, check out the library, etc. Since her Golden Girls days, La Betty’s humor has come from the kindly, slightly bewildered way she delivers a bawdy line. She’s on best behavior here -- no kitsch, no hook -- and it’s more than a little dull. But there’s such earnest warmth to her voice (she could make the phonebook sound like a Hallmark card) that it won’t kill you to listen to these stories at least once, especially if you’re in need of a hug. And it also wouldn’t kill you to give your grandmother a call -- she loves you very much. Katie Bircher, editorial and marketing assistant at The Horn Book, Inc., is a former bookseller and holds an MA in children's literature from Simmons College. Questions? Suggestions? Leave a comment or email kbircher [at] hbook.com.